In recent months Auckland has become a hot spot for new international franchises, from British fashion to Taiwanese bubble tea. Now Malaysia's PappaRich brings its food to this ever growing city. Set in the Sky City Metro the restaurant imports bright lights, dark polished tables and splashes of green. The unmistakable Malaysian accent can be heard from many of the staff. It's entirely reminiscent of mall food courts in South East Asia and PappaRich creates a welcoming and clean space. The menu covers every well known Malaysian dish, plus those slightly rarer items. I haven't seen many Milo dinosaurs, soup pan mees or kaya toasts in this country. Their inclusion at PappaRich was a very pleasant surprise. Our host explained the ordering system: write the number of your dish on a piece of paper, press a buzzer and let your host zip your order away. We ordered the roti canai, with small bowls of dal (lentil curry) and chicken curry, the char koay teow and chilli pan mee. The food came as quickly as I'd expected, since staff were preoccupied with serving and clearing, instead of providing customer service. We were ignored a couple of times as we tried to ask for water. The dishes placed in front of us looked tantalising without decorative fluff, and portions were reasonable. We dug in. The pan mee noodles were thick and solid, needing a little bite to break them up. The ikan bilis (small fried fish) were crisp and salty. The dollop of sambal added much needed flavour and a chilli kick. The runny egg yolk emulsified the whole mixture. I ate with relish. It'd been too long since my last pan mee. The char koay teow was a more modest affair, but then I find char koay teow comparable to fried rice: a good stomach filler, but nothing to get excited about. The roti canai were bizarre...Crispy, and only a hint of oiliness, as they should! But also sweet, as if they'd been sprinkled with sugar. The thick, curried dal was morish and paired perfectly with the crisp roti. But the coconut rich curry was also sweet... Far too sweet. Why was the dal just right, but the roti and curry mixed with overwhelming sugar? Aside from the sugar mystery, the dishes were undoubtedly well prepared with a bit of Malaysian authenticity. The variety of choice, which included rarer dishes, also impressed me. 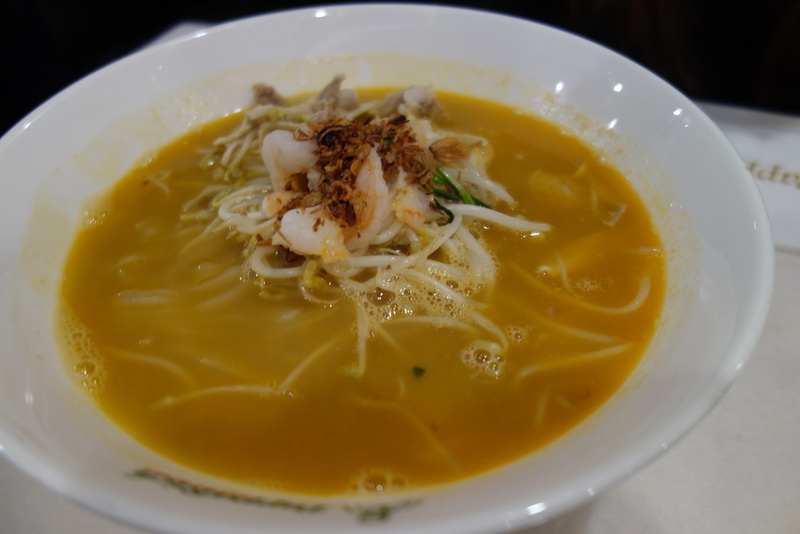 PappaRich is clean, welcoming, efficient and serves mostly enjoyable Malaysian fare. The breadth of the menu covers the basics and more unique dishes enable PappaRich to stand apart from other Malaysian restaurants in the city. Shame about the sweet chicken curry and roti canai.